Nil Battey Sannata owned me. “Ladkiyon ki maths se banti nahi” , “Aur mera bhi maths nil battey sannata hi hai,” Ratna Pathak says and I don’t find it sexist for the first time. There is this charm around her, that fails everything and leaves you smitten every time she appears on the screen. She is clearly ageing very VERY beautifully. And, you know, I can go on and on talking about her, despite smaller than expected tiny-mini screen time she has in this film. But lets stick to the film, for Ria and Swara Bhaskar’s sake. Or, Pankaj Tripathi’s sake, who played the idealistic school principal as impeccably as only Pankaj Tripathi could. Now you have a fair idea that this film is power packed with one of the most talented performers of our time. Add to it, great camera work and vivid stroy-telling, you have a treat to all five-senses. The treatment of the film is quite international and I loved the surreal jump cuts and fade in-fade outs. 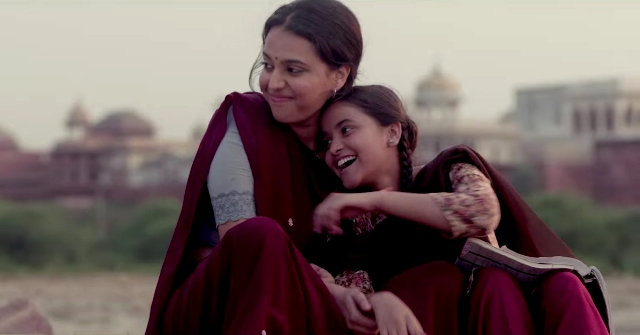 Nil Battey Sannata explores the nuances of life of a house maid (played by Swara) and her child, Apeksha (Ria). It revolves around Ria’s secondary school education and very subtly touches the education mafia of the country, hits it hard, nails it and passes over like a summer breeze after spring clean. Then you utter in your head, Dafaq did I just see! That’s the other side of the spectrum, isn’t it? Chanda (Swara) toils hard to save some money for Ria’s pre-board coaching class. She knows her child needs the very unattainable coaching. Coaching classes are there for pure business because education is more business than ever before today. Ria remains unfazed of her mother’s plight throughout, like all of us. Allow me to digress a little here, we love to take our mothers for granted. She looks good in the kitchen,cooking and toiling for us. Even after we become “that something” or a collector in this film (the film ends there, spoiler, tada! ), she is there in the kitchen because that’s what she is meant for, probably? NBS is a fairy tale with a twist. We have a Cinderella who wants to do household chores but has fleeting dreams about Ranbir Kapoor and Salman Khan. She doesn’t want a night out or a prince. She is fine with what she is. Her name is Apeksha and that’s the twist. The film is surely about a mother’s Apeksha or expectation from her child. She expects a better tomorrow. Nothing extravagant, but better. In her past, Chanda had to drop out from her school because she was bad at maths or “maess” as she says it. She obviously doesn’t want the same for her girl. I was in tears throughout the second half of the film, to see a mother’s mammoth determination to bring her Apeksha on right track. For once we knew Apeksha could fail, but Chanda’s expectation would not. NBS is about unnerving and unending dreams of the working class. We have an immensely hardworking child named Amar, whose brother runs a small time dhaba to bring him up. Amar works as a mechanic after school. When he comes out from under a car in one of the scenes, all covered in grease and dirt, that 15 year old lean sweet little genius of a child, it sure left me unsettled. Apeksha remained unfazed. Like all of us. I could not understand though, why all upper caste surnames have been used in the film. 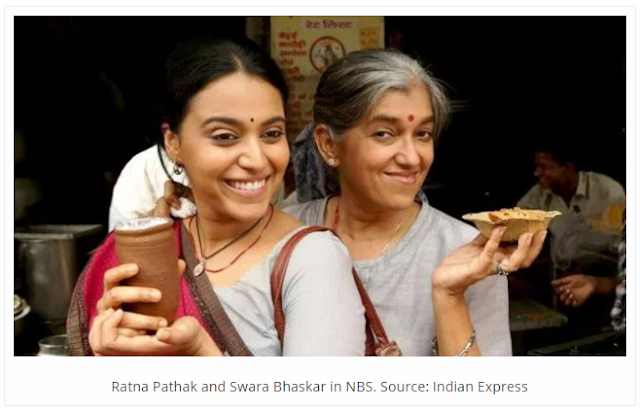 Right from Chanda Sahay to Dr Diwan aka Ratna Pathak to principal Srivastava, everyone is upper caste! Was it to bring uniformity or to avoid the caste discourse totally? Coming back, as Nil Battey Sannata shows education is still a far fetched idea in our country of over 100 billion people. But education mafia has full access to it. At school, we are goalless because of them and because “doctor ka beta doctor banega.” But we have determined mothers across class and creed. Maybe we should celebrate just that. And oh, did I say Swara Bhaskar has stolen the show? I can’t imagine any other actor playing Chanda as good as she did. She was so much into the character that I could not find Swara anywhere on screen. This holds true for principal sir (Pankaj Tripathi) and Apeksha (Ria) too. That have owned it totally! Only Ratna Pathak was Ratna Pathak, the most beautiful woman I have ever seen.